One of Spring13’s newest clients, The Family Firm, laid a challenge on the table (errr…cutting block) within the first month of partnership…create brand awareness for a financial service at a festival. Not just any festival – the “Taste of Bethesda” premier foodie scene with over 60 neighborhood restaurants! As an independent, Fee-Only™ Financial Advisory firm located in Bethesda, MD, The Family Firm focuses on the development and implementation of customized financial management strategies. It was crucial to not only relay the firm’s uniqueness but to also seamlessly integrate the brand into a culinary atmosphere. Spring13 created a playful campaign that positioned The Family Firm as “personal chefs for wealth management.” Infusing a community spirit into the design, Spring13 developed collateral with a red-checkered home-style tablecloth-background feel that promoted their customized recipe, financial management style. 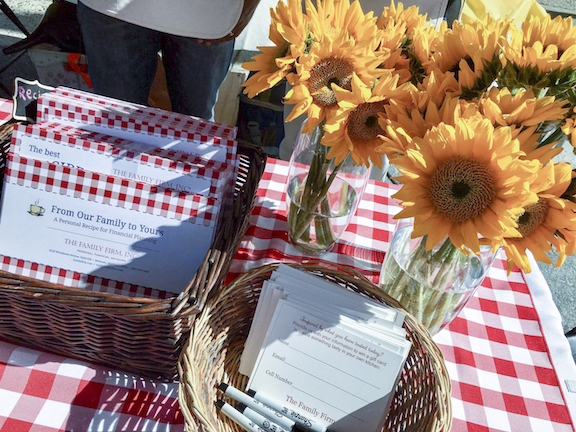 Components included two e-blasts, a take-away recipe card listing key ingredients of The Family Firm’s financial management success and a stylized exhibitor booth with potted sunflowers and custom apron and measuring spoon giveaways.